by Dr. Philippe Encausse, Grand Master of L’Ordre Martiniste de Papus (Paris). Always choose a center where prayers (regardless of the cult) are practiced. Remember that true masters do not make books, and place simplicity and humility over all science. Distrust pontiffs and those who call themselves perfect. Do not restrict one’s freedom with an oath, chaining an individual within a clergy, or within a secret society; only God is entitled to receive an oath of passive obedience. Remember that all invisible powers come from Christ, God comes in flesh through all planes, and never enter the invisible level through relationships with an astral or a spiritual being not confessing the Christ in this way. Do not seek to gain “powers”, wait until the Heavens give them to us as long as we deserve to have them. Strongly believe that mankind is not forsaken by the Heavens, even at times filled with denial and doubt, and that we have our presence in the physical plane for the sake of others and not for ours. Remember that physical purification through food is childishness, unless it is supported by astral purification, charity, silence, spiritual purification and the efforts of not thinking or speaking ill of absentees. Bear in mind that prayer, which gives all peace of Heart, is preferable than any magic, which would give no more than vanity itself. "True esotericism is the Science of the adaptations of feelings. Feeling is the sole Creator in all planes, and an idea is a creator found only in the human mental plane, it hardly reaches the Higher nature. PRAYER is the greatest mystery and can allow for those who perceive in the Christ’s influence, and in the fact that God comes in flesh, to receive the highest influences in action in the Divine plane." Finally, in the pamphlet printed of mysticism, which he had dedicated to the human soul before birth and after death, and which is used as a key to a gnostic book Pistis Sophia, a work of Valentin, Papus further describes the spiritual evolution of mankind, which before us is clear evidence of the importance he gave to the spiritual path. "Poor victim from the folly of the great, I honor you and thus carry those who have enlightened you at the last moment of death with my prayers. Sensing death near you, you were brave to prepare your soul with the physical separation, and, dark hero, you have called the One who hears us all … May your deed be blessed. Whether you are an enemy to my motherland or an envoy of this vanity that had sacrificed the flower of its mankind only to fulfill the low satisfaction of their goal is no longer important. "Within the heart of Our Lord lie neither friends nor enemies when dreadful Death crosses over, there are only Minds that were sacrificed for the Ideal, and were terminated at the sudden end of their worldly journey. "Enemies of yesterday, let us communicate in the ideal today, higher than human quarrels. "You have a family, a poor child, a mother about to fall into tears, sisters who will remember, and brothers who will perhaps follow your path. "And all, in their pain, will thus bow low and pray… Innocent victim of the blind ambitions against the conscious and bright evolution of free People, you carried out your duty, but the merciless hand of Fate had marked you with its finger, and your evolution is hence accomplished. The same pins were found the following week as well. Still forming the coffin and the cross. The servant who had seen them on the previous night (while coming on duty), and who had become slightly psychic, conceived such a nervous shock that she kept trembling and shivering all day long. Furthermore, she obviously asked to leave the very next day! As his coffin, covered with the three French colours, was carried outside the Notre-Dame-de-Lorette church, or where the ceremony was held, a piece of an angel’s hand (a finger and not an angel’s head as was mistakenly written in V.-E. Michelet’s Les Compagnons de la hiérophanie) broke away from one of the sculptures and fell right into the center of the crown which I had placed on the coffin. A symbolical yet a strange drop which resulted in a number of comments from the crowd of friends, the obliged, and the disciples who were literally overpowering the very church and the square, for there were just so many of them who had wished to pay their final tributes to Dr.Gerard Encausse-Papus, their master, their benefactor and their beloved friend. "I may perhaps be giving way the secrets of a friendship to which I have boundless honor, but it seems to me that until the crowning achievement of this distinguished career, a voice says it out loud that a countless number are whispering their gratitude. The scholar, the philosopher with magnificent insights, powerful propagandists, the applauded speaker, the clairvoyant, the skillful practitioner, and all these admirable aspects united in the person of this man of virtue, whose venerable remains are confided today, to our common Mother. "Let us tread on the heels of this great initiator who wished to be no more than our beloved companion and who had enough strength to conceal his suffering and woes under a constant smile. "Let us shed no more tears; for they will only hold him back in the shadows. And let us rejoice, as he had rejoiced for three days, intending to finally join the almighty Practitioner, the authentic Pasteur of souls, the eternal and beloved Friend to whom he was his loyal servant." Such was his life and carrier, which was however regrettably too short! 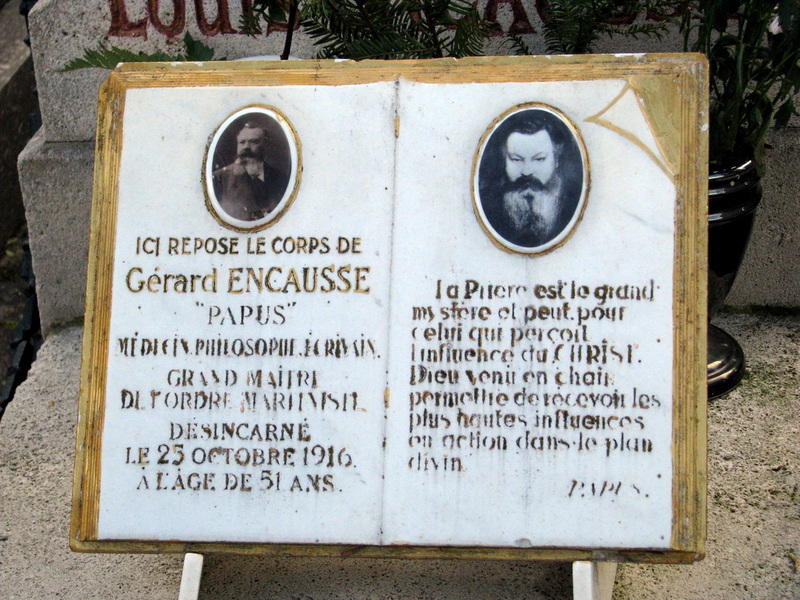 From a doctor of bodies and souls, to an ardent spiritualist and then to a devoted soldier of Christ, was all; Gerard Encausse-Papus. With the honor and joy of being his son, I may perhaps be likely to adorn him with all his virtues and sacrifices. But I am certain it would not turn out to be an impartial or any constructive effort. I therefore consider it my duty to state here that, in the world of “Les compagnons de la Hiérophanie”. Eliphas Levi, Saint Yves d' Alveydre, Stanislas de Guaita and Barlet placed him significantly higher in the philosophic and the high traditional science domain. Whereas Papus had the lavish and the learned verb of Eliphas Levi, who through his work, was posthumously his first master, together with the powerful insight and the great culture of Saint Yves d' Alveydre, the literary talent and the philosophic acuteness of Stanislas de Guaita, the encyclopedic and deep erudition of Barlet, while on the other hand, he was a brilliant director and effectively served the cause of spiritualism, correspondently to the mission to which he had been attributed by the divine Will. Rejected by some, misunderstood and defamed by others, certain freemasons treating him as “Jesuit” and certain intolerant Catholics calling him the “limb of Satan”, scoffed by a number of “strong minds”, he nevertheless continued to lead the good fight for the defense of a cause, which he knew was just: that of Christian spiritualism, of the union of Science and Faith, and he finally succeeded! This is what all criticisms done in good faith must or should realize. This is what I wish to remind of his biography which, if inexorable Fate had not harshly decimated the head teachers of the compagnons de jeunesse and of the highly qualified followers of Papus, would have benefited from being entrusted to a more highly competent and scholarly pen than mine. But even after sixty-two years after his “death”, what greater joy can there be for me to honor his memory once more, which I believe is inspired by my subsidiary affection, my full gratitude and my infinite respect. When you were born, you cried, and the world rejoiced…. yet you lived your life so that when you die; the world cried and you rejoiced. Encausse, P. (1979). Papus, le -balzac de l occultisme: Vingt-cinq annees d occultisme occidental. Paris: P. Belfond. pp. 175-184. Photograph courtesy of Rev. Winston Wiggins, Ecclesia Gnostica.